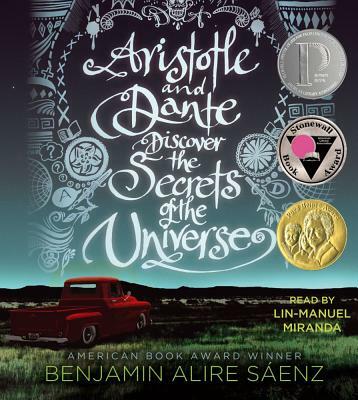 Aristotle and Dante Discover the Secrets of the Universe (CD-Audio) | The Drama Book Shop, Inc.
A lyrical novel about family and friendship from critically acclaimed author Benjamin Alire Sáenz. Aristotle is an angry teen with a brother in prison. Dante is a know-it-all who has an unusual way of looking at the world. When the two meet at the swimming pool, they seem to have nothing in common. But as the loners start spending time together, they discover that they share a special friendship—the kind that changes lives and lasts a lifetime. And it is through this friendship that Ari and Dante will learn the most important truths about themselves and the kind of people they want to be. Benjamin Alire Sáenz is an author of poetry and prose for adults and teens. He is the winner of the PEN/Faulkner Award and the American Book Award for his books for adults. Aristotle and Dante Discover the Secrets of the Universe was a Printz Honor Book, the Stonewall Award winner, the Pura Belpre Award winner, the Lambda Literary Award winner, and a finalist for the Amelia Elizabeth Walden Award. His first novel for teens, Sammy and Juliana in Hollywood, was an ALA Top Ten Book for Young Adults and a finalist for the Los Angeles Times Book Prize. His second book for teens, He Forgot to Say Goodbye, won the Tomás Rivera Mexican American Children’s Book Award, the Southwest Book Award, and was named a New York Public Library Book for the Teen Age. He teaches creative writing at the University of Texas, El Paso. * "A tender, honest exploration of identity and sexuality, and a passionate reminder that love—whether romantic or familial—should be open, free, and without shame." * "Authentic teen and Latino dialogue should make it a popular choice." * "Meticulous pacing and finely nuanced characters underpin the author's gift for affecting prose that illuminates the struggles within relationships." "Sáenez writes toward the end of the novel that “to be careful with people and words was a rare and beautiful thing.” And that’s exactly what Sáenez does—he treats his characters carefully, giving them space and time to find their place in the world, and to find each other...those struggling with their own sexuality may find it to be a thought-provoking read." "Sáenz has written the greater love story, for his is the story of loving one’s self, of love between parents and children, and of the love that builds communities, in addition to the deepening love between two friends." "Ari’s first-person narrative—poetic, philosophical, honest—skillfully develops the relationship between the two boys from friendship to romance." "Sáenz is a master at capturing the conversation of teens with each other and with the adults in their lives." "This book took my breath away. What gorgeous writing, and what a story! I loved both these boys. And their parents! Don't we all wish we had parents like theirs? The ending - and the way it unfolded - was so satisfying. I could go on and on...suffice it to say I will be highly recommending it to one and all. I'm sure I'll reread it myself at some point. I hated having it end." "I’m absolutely blown away. This is Saenz's best work by far...It’s a beautiful story, so beautifully told and so psychologically acute! Both Ari and Dante are simply great characters who will live on in my memory. Everything about the book is absolutely pitch perfect...It’s already my favorite book of the year!"